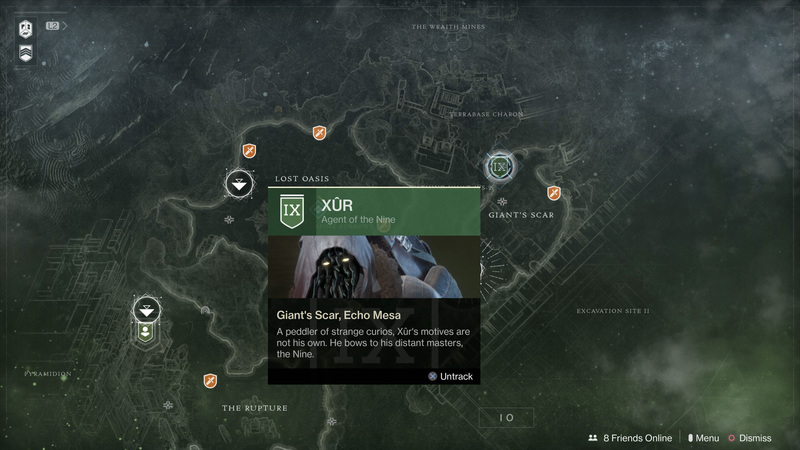 Xur’s location for Week 3, September 29, in Destiny 2. While learning Xur’s location no longer requires you to hit up Google every Friday morning, it’s worth knowing what the Agent of the Nine is selling before you fire up your PS4 or Xbox One and track him down on one of the four planets. After all, we’ve been playing Destiny 2 long enough that he very well may not have the weapons and armor you’re looking for. In any case, we’ll still tell you where he is, but we’ll also tell you what Xur is selling this fine Friday morning. You can find Xur, the Agent of the Nine, hanging out on IO. Specifically, he's in the Giant's Scar region, which has a fast travel point that should put you close to him. As per usual, Xur is selling one weapon and three armor piece. Each of the three main classes in Destiny 2 get an armor piece. So far Xur isn't selling much, but hopefully this will change in the months and expansions to come. The number of Legendary Shards required to buy each piece is listed below with the gear he has. This answer is going to remain the same for the foreseeable future. If Xur is selling Exotic weapons and armor that you don’t have, buy it. Nobody wants to have a repeat of the Gjallarhorn incident from the first few days of the original Destiny. I waited more than a year to get a crack at another Gjallarhorn. I’ll never get over that. Of course, if you’re on a budget, you might have to be a bit pickier. In that case, buy whatever he’s selling that your main character doesn’t have first, and then get into the reviews of each item to see if the rest are worth it. Now that you know Xur’s location for Week 3, September 29, 2017, be sure to visit the Destiny 2 complete strategy guide we’ve been building since the game’s release. It’s go everything you need to make the most of your journey as a Guardian.